Commercial spaces, especially in Florida, must abide by strict building codes to ensure safety. When creating any design for a commercial space, it is imperative to follow what these building codes enforce. In regards to designing a staircase for commercial spaces, one requirement you would want to implement into your design is the height of the railings and handrails. As per Florida Building Code, railings must be 42″ high and handrails must be 36″ high. 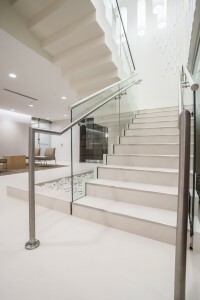 In the event where the staircase exceeds 44″ in width, it is required to have a handrail on each side of the staircase. This ensures the safety of dual traffic when traveling up and down the staircase simultaneously. 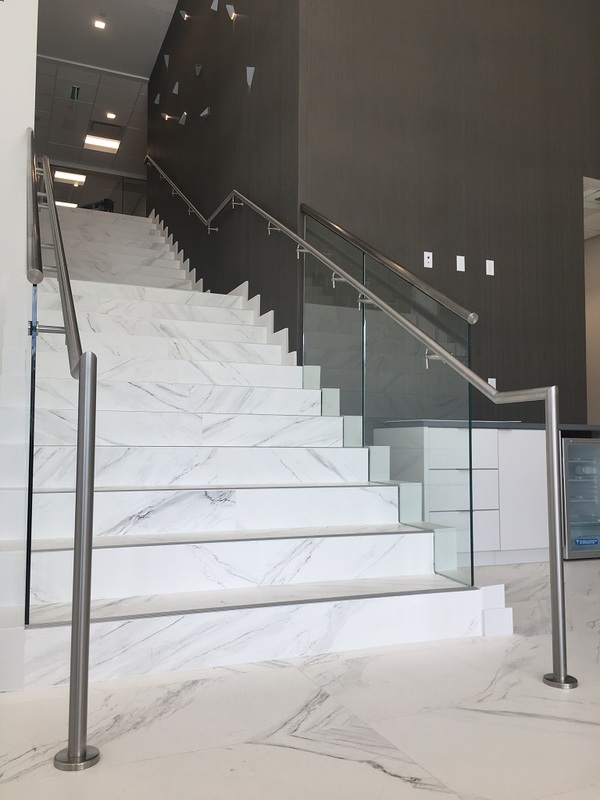 Rounded Stainless Steel Handrails in a Brushed Finish were installed on both sides of this Commercial Staircase, as per Florida Building Code. In regards to the type of materials utilized in commercial spaces, when selecting glass, it is stated in the Florida Building Codes to use Laminated Glass for safety purposes. In the event where laminated glass is broken, the broken glass panel stays intact due to an inter-layer between the glass. This prevents any shards of glass from injuring anyone. Implementing these building codes into your commercial design will ensure safety without compromising the overall aesthetic of your design.